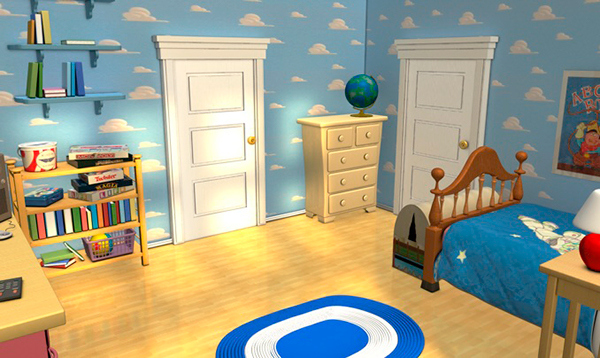 The way we see it, Andy had it all: Woody, Buzz, Wheezy (yes, the penguin deserves a top mention), and last, but certainly not least, the single greatest kid’s room of all time. 1. Clouds on clouds on clouds… on clouds. Have you ever seen real clouds look so pristine? These perfectly puffed masterpieces are an Andy’s room/our childhood/daydreaming staple. Looks pretty easter egg-cellent, if we do say so ourselves. 3. Plenty of natural light. Andy’s got a lovely view of the sunshine and the suburbs from his second-story bedroom. Does Buzz’s laser count as an additional light source? Let’s say yes. Sorry, Woody. But this comforter rocks. Cue montage. The ideal concert venue for all the singing penguins in the house. Study up on those easter eggs. Pay no attention to the chicken. Pay more attention to the glow-in-the-dark footprint stickers. 8. Cool grown-up Andy and his cool grown-up things. Let’s take a closer look. Skateboarding? Cool. BMX biking? Cool. Map of the world? Cool AND cultured. But let’s be real — the toy chest is the coolest thing in here. What’s your favorite part about Andy’s room? Tell us in the comments below!